"These tassies are great. I don't make them a lot because I can't stop eating them! ENJOY!" Beat together the cream cheese, flour, and 1 cup of the butter flavored shortening until well combined. Press dough into a mini muffin tin. Bake at 350 degrees F (175 degrees C) for 18 minutes. Melt the caramels in the microwave or on the stovetop. Add 1 (5 ounce) can of the evaporated milk and 2 teaspoons of the coffee liqueur. Set aside to thicken. 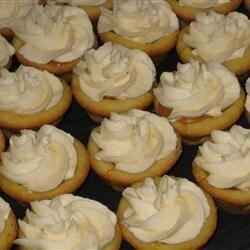 To Make The Topping: Combine the butter, the remaining 1/2 cup shortening, the remaining 5 ounces evaporated milk, white sugar and 2 teaspoons coffee flavored liqueur. Beat for at least 8 minutes. To Assemble: Pour caramel mixture into the baked cups, filling them halfway. Wait 10 minutes and then top with the topping mix. Sprinkle with ground pecans, if desired. See how to make a fancy flan that’s creamy, sweet, and easy to make. these should be named little slices of heaven these are great! I just made these for a wedding reception and everyone thought they were delicious. They take time, but they are well worth it. I make these every Christmas and they're always a hit! Deeelish!